Quinoa, quinoa, quinoa, you’ve probably heard about it too many times to count, and with good reason too. It has become one of the most popular healthy foods. Quinoa has been featured all over Instagram, Pinterest and on hundreds of blog sites, well-known for its bright colors and aesthetically pleasing presentation. After seeing all the pictures and hearing raves about it from your insanely healthy best friend, you have to admit, you’re pretty curious. But where to start? There are a few different kinds to choose from. What’s the difference? Which one is the best? Well, you’ve come to the right place because you’re the first contestant on the show (drumroll please)… “Which Quinoa is Best For You?” Too much? Yeah definitely, scratch that, but we still want to help you get on the right track by comparing a few popular quinoas. According to growers, buyers, and sellers, there’s not really a huge physical difference between the quinoas other than the color. The texture, size, and taste are pretty much the same in all variations of quinoas. The few differences lie beneath the surface: primarily around the nutritional facts. Let’s compare and contrast two of the most popular varieties. White or ‘golden’ quinoa is the easiest to find, commonly stocked on most grocery store shelves. Visually, the quinoa is a beige or pale butter color and commonly described as mild and fluffy, making it the least crunchy of the quinoa types. It also cooks the fastest (about 10 or 15 minutes). According to Marie Dannie with Livestrong, white quinoa has more protein than red, with 7 grams of protein per ¼ cup versus the 5 grams in the red quinoa. Studies point to the fact that white quinoa has slightly more vitamins and minerals than red quinoa such as zinc, iron, riboflavin, and phosphorus, however, the difference is very slight. 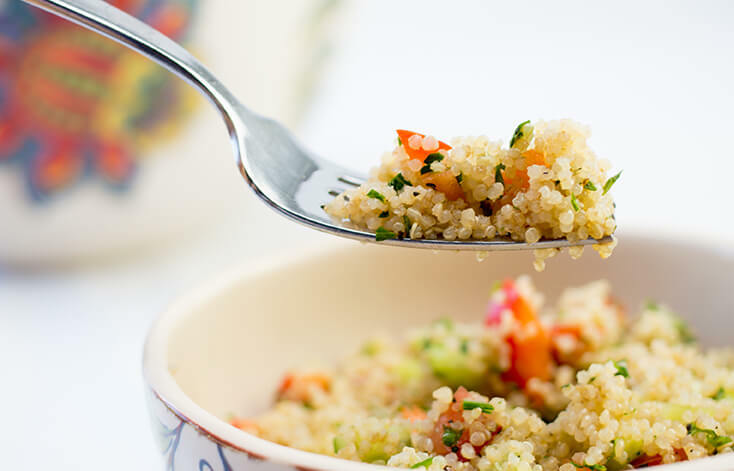 And lastly, white quinoa has about 170 calories per ¼ cup making it an ideal healthy meal, that still fills you up. Red quinoa, known for its intense earthy red color. It’s crunchier than white quinoa and cooks in roughly the same amount of time but can use a few minutes more depending on preference. Although it has slightly less protein than white, it makes up for it in its fiber. Livestrong states that red quinoa has “over double the amount of fiber per 1/4 cup, with 5 grams” whereas white quinoa has only “2 grams per 1/4 cup”. This fiber provides 17-24% of the recommended daily amount of fiber needed for women and 13-24% for men. It still has high levels of vitamins and minerals, albeit slightly lower than white. And finally, red quinoa has around 180 calories per ¼ cup. Additionally, the nutrients and vitamins found in quinoa keep your gut healthy and clean which helps with weight loss and overall health improvement! And if that isn’t good enough for you, it’s gluten free!! So really, which quinoa is best is up to you. Whether it be the nutrients, the texture, or simply, the color, you can’t seem to go wrong with your choice. Have fun experimenting and eating! Also be sure to check out our Tri-Color Quinoa Pilaf!